Tourism has become a boom industry in recent times and a major employer. Ecotourism has emerged out of a growing interest in outdoor adventure activities - from mountaineering to low impact bush walking. Develop in the learner an awareness of ecotourism destinations in existence and possibilities (in the learner's country). 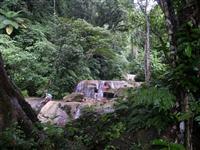 Nearly all definitions of ecotourism include the focus on the natural environment. This focus is flexible and allows the focus to range from say a biome such as a rain forest and all that it includes to a narrow product focus on a single species. Thus the focus may be holistic or elemental, although it is best to consider a single species in the context of its broader environment to provide a better educational outcome. The inclusion of the cultural welfare of the local/indigenous populations as a key component in ecotourism was introduced to reduce exploitative practices by foreign owned companies that essentially were not investing back into the local economy or environment and used locals in the lowest entry level employment. The local economy is stimulated by this spending and economic growth is a flow-on effect, creating employment and economic security for the local rural populations. Income is also generated through the fees associated with permits and licences; this ensures that more money is spent on public land management and conservation. Job opportunities in this field therefore also increase with a greater demand for park rangers, kiosk operators, park assistants and so on.